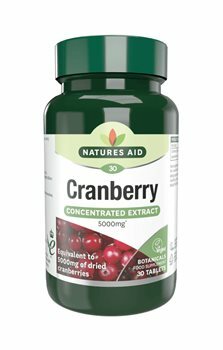 Natures Aid Cranberry tablets each contain 200mg of cranberry extract equivalent to 5000mg of cranberry juice per tablet, and unlike many cranberry juices available, Natures Aid cranberry tablets do not contain any sugar. Cranberries support the body's natural defences and help maintain a healthy bladder and urinary tract. Free from Artificial Flavours, Colours & Preservatives, Lactose, Yeast & Gluten.